My recipe for Snowman Donut Pops was such a hit last week that I thought I’d share another semi-homemade holiday treat. 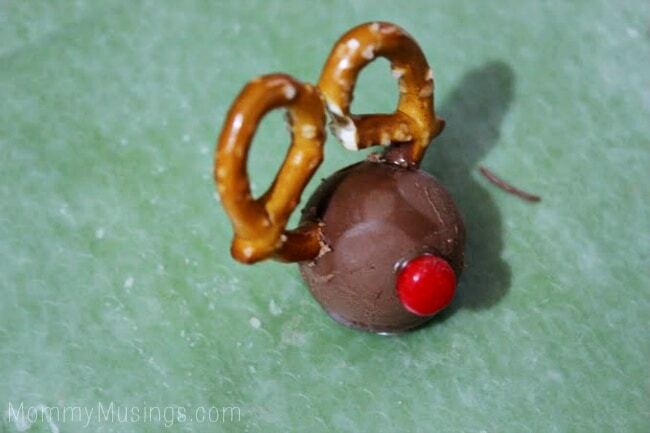 This recipe for Rudolph Reindeer Truffles is easy to assemble, using only chocolate truffles, melting chocolate, pretzels and a few candies. The results are truly ADORABLE and will make a lasting impression at any Christmas or holiday party. Heat candy chips in large bowl by microwaving for 30 seconds, stirring and repeating until melted. If Truffles are not flat on bottom, dip bottom of truffle in chocolate and place on wax paper. Allow to set. Using a toothpick, gather up a small bit of melted chocolate and paint on back of red candy "nose"; place on truffle. Hold in place until set. Allow chocolate to set & enjoy! They look almost too good to eat! Almost. These are just adorable, i know my kids would love these! These look much more difficult than they are, which is great for a busy mommy like me, plus I’m sure they taste amazing! What a great easy holiday treat to make! They also look delish! Those are cute and easy! Aww, so cute! The eyes remind me of Grover from Sesame Street for some reason! 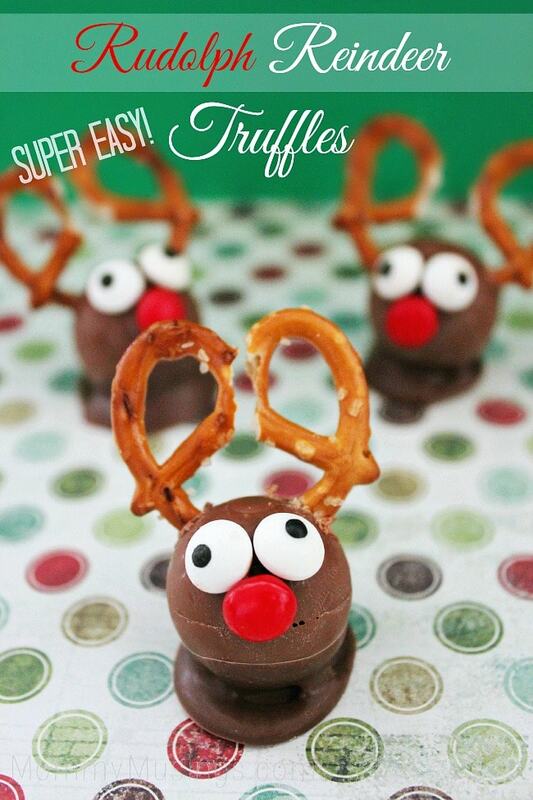 These reindeer truffles look too cute – and delicious! I like the simplicity of them best. What a cute treat to make! 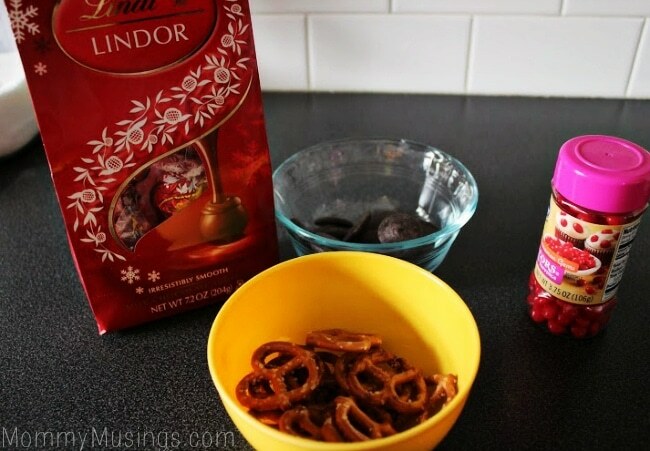 I love Lindor chocolates and this is such a cute idea! I love truffles, and that is really adorable! These are just too cute, and they look pretty tasty too. what a fun Christmas themed treat. These might be just the thing santa wants this year. How cute I love the red nose, these would be cute at a party. I love Lindt! These are darling and I am sure they would be amazingly tasty too!!! 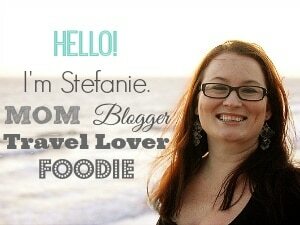 Oh yes – I just got a new chocolate fondue pot and wanted to do something different with it – this will be perfect! Seriously, those are super cute.